The 2015 Cup Tasters Competition Entry is Opening Tomorrow! The SCAE UK are delighted to let all those who have expressed an interest, plus all our UK Chapter members, that the registration for the 2015 SCAE UK Cup Tasters Competition will open tomorrow, Thursday 23rd April, at 5pm! Registration will close when we have 30 entries or on Tuesday 5th May at 5pm, whichever is sooner, so please hurry if you wish to enter! Why - For the chance to be crowned UK Cup Tasters Champion 2015! How - Click Here or visit the scaeuk.com website to register to enter! *Don't forget that in order to compete in all SCAE UK competitions you need to be a current* SCAE member or work for a Company who have a SCAE Company membership* to enter any SCAE competitions. Join the SCAE Here * You or your company must be a paid up member at the time of the competition in order to compete. Dublin, Ireland (27 March, 2015) - For the past 15 years, the World Barista Championship (WBC) stage has played host to innovation from the world’s best baristas. While we’ve made small changes to the competition format over the years (remember the mandated sugar bowls? ), it’s time we introduced more changes. Bigger changes. Changes that bring the focus of the competition back to its innovative roots. WCE will be announcing exciting changes in and around this year’s WBC in Seattle April 9-12, 2015. These changes will take effect for the 2016 WBC (Dublin, Ireland). shifts indicate positive steps towards the continued evolution of a competition platform that consistently explores and shares advances in specialty coffee. In the sections below, we will deliver specifics about the WBC qualified kit and the new milk drink course. Since the competition began in 2000, the success of a World Barista Champion consisted of two essential elements: coffee quality and barista skills. Starting in 2016, WCE, with the support of MAHLKÖNIG, will provide all competitors on stage a WBC-supplied grinder in addition to the WBC-supplied espresso machine in an effort to level the playing field and bring the focus of the competition back to its original ethos. MAHLKÖNIG have committed to bringing 30 grinders to the 2016 WBC in Dublin, along with continuing their support of national competitions in the lead up to the WBC. The 2016 & 2017 Qualified Kit will be provided for use on the world stage by WCE’s qualified espresso machine sponsor, Victoria Arduino, and WCE’s qualified grinder sponsor, MAHLKÖNIG. The complete Qualified Kit will be the same for all competitors throughout competition, thus intensifying the focus on those qualities at the core of the competition: specialty coffee quality and the talent, skills, and passion of the baristas who join us on the world stage. endeavor, competitors only deserve the best equipment available,” states Philipp Baumberger, CEO of MAHLKÖNIG. Most consumers understand coffee as a beverage to which milk is added, and the cappuccino course was always designed to acknowledge this and promote excellence in this category of coffee beverages. As new specialty coffee culture emerges, and social media and the internet make the world smaller, we now know that there is more than one way to serve incredible milk and coffee drinks. After fifteen years of focusing on a single definition of a milk drink on the WBC stage, we think it’s time to open up the milk beverage course to something that better represents where we are today as an industry: open-minded to anything new and delicious. Starting in 2016, a “milk beverage” will be defined as a hot beverage, made from a single shot of espresso and steamed milk, allowing competitors more flexibility in choosing a coffee-to-milk ratio that showcases their coffee best. The competition working group, a team of highly committed and experienced individuals, will be available to answer any queries the community has about the forthcoming changes for 2016. The additional evolutionary changes will be announced on the world stage in Seattle, directly preceding the finalist announcements on Saturday, April 11, 2015, as well as throughout the coming year. For more information on this year’s WBC, please visit: www.worldbaristachampionsip.org/2015-schedules. We now have a brew recipe - How does this help me, and what can I do with it? A brew ratio refers to the weight of coffee grounds in relation to the weight of espresso in the cup. By changing the weight of the coffee dose, or the weight of liquid espresso in a shot, we therefore change the brew ratio. Changing a brew ratio alone will change the taste, balance and mouthfeel of a drink - but adjusting the grind as well will restore flavour balance at different ratios. As an aside, different brew ratios can be used to refer to varying descriptions of neat espresso, but what we are really describing is espresso of differing strengths, viscosity and mouth-feel. 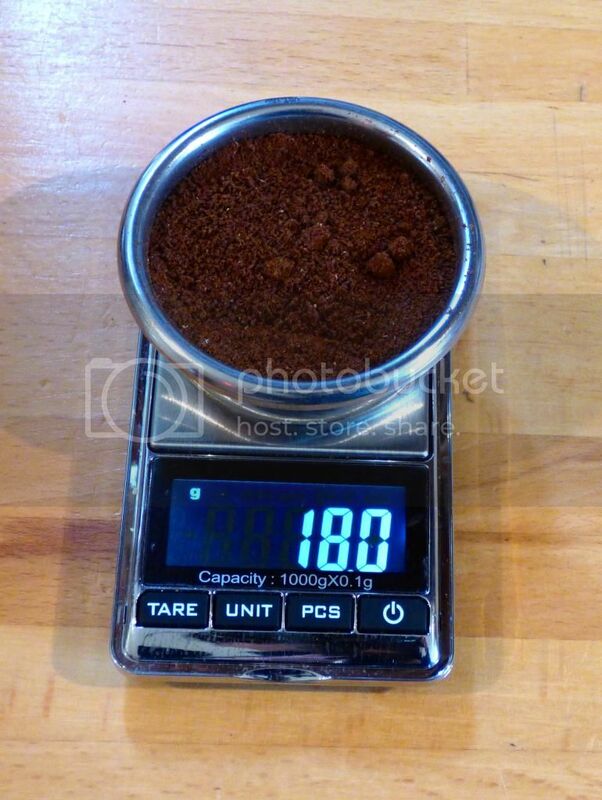 1:1 to 1:5 (18 grams in - 18.0 to 26.0 grams out) might be termed as a “ristretto” espresso. 1:1.6 to a 1:2.5 ratio might be termed as a “normale” espresso. 1:3 and over might be termed as a “lungo” espresso. One could use the same bean and make an espresso using each of these ratios, then taste each shot to help understand the difference in clarity, balance and mouthfeel between them. This will give an idea of what kind of strength and mouth-feel someone prefers. A brew ratio will help you replicate that. So if you are new to espresso, or have a new bean that you are struggling with, how can you use the scales and a brew ratio to help you get a balanced cup? Here is one approach that may prove helpful. I’m going to start with a brew ratio of 1:2 as a starting point (this is my current preference - it makes a drink with the resulting thickness, balance and mouthfeel that I predominantly enjoy). So I'm dosing at 18.0g & aiming to get 36.0g in the cup (dose will be dependent on the basket/headspace and equipment you are using). Let’s be clear – I’m keeping my dose, tamp pressure, and extraction temperature all constant, in this process. 18.0g into 36.0g in 20-25 seconds. 18.0g into 36.0g in 26-30 seconds, with a finer grind. 18.0g into 36.0g in 31-35 seconds, with a finer grind still. Taste each one & note down which one you prefer. The one you prefer is a good pint for starting to dial in a coffee . You may prefer different coffee's at different brew ratios , this is fine , nothing is absolute , and there is no " one size fits all "
Changing the brew ratio- what will it do. Credit & thanks to Andy Schecter whose work on brew ratio based on mass makes all our coffee lives a better place and this article possible. Again, before you start reading this, lets address what this isn't about so you aren't disappointed. This isn't about perfect distribution or dosing techniques. This isn't the only way to weigh, and whatever process you use will be dependant on the grinder, the scales, and the machine you use. These are not gospel, just examples. At the end of this article the reader should understand what parts of the espresso making process need weighing, and a couple of suggestions on how. You will need some scales that measure to 0.1 g accuracy and that will fit whatever cup or cups you want to make your espresso in. There are plenty of these in eBay for around £5 ish and plenty of threads recommending which ones to use on the forum. As an aside if you are measuring by weight don't get hung up on how big or small in volume your espresso is. Your measurement is weight not volume in this process. "I dosed 18g of coffee and made 36g of espresso in 27 seconds"
The white large scales in the photos are Acaia scales . 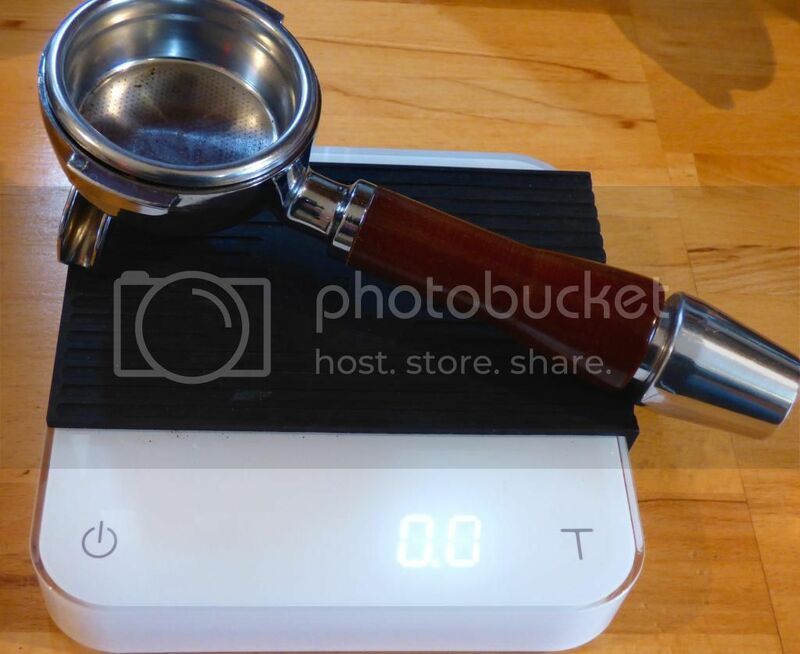 Before starting to read, this post isn't about what brew ratio one should use, or what is the best dose to start with, but more a general reference as to why you 'might' want to entertain the idea of using scales and weight to help you make an espresso. It is an often asked question as to why someone should buy scales, and start measuring your dose of coffee and the espresso it makes by weight. But nearly all people when making espresso will measure to one degree or another - just in different ways, and with more or less accuracy. These are all forms of measuring, with a view to having some way of adjusting the variables in espresso to achieve a desired taste. I would think that most forum members are using a combination of some of the above to help achieve a drink they like the taste of. So measurement isn't a bad thing, everyone uses it. Weighing and using scales is a different and I would say more accurate method of measuring. Why Weigh and Use scales ? Again its measuring, just in a different way, to a more accurate level. Measure the weight of the espresso it makes, again to 0.1g if you can. Do not concern yourself with how much volume this is. Focus on the weight only. Why is weighing my espresso better or more accurate than judging it by volume ? 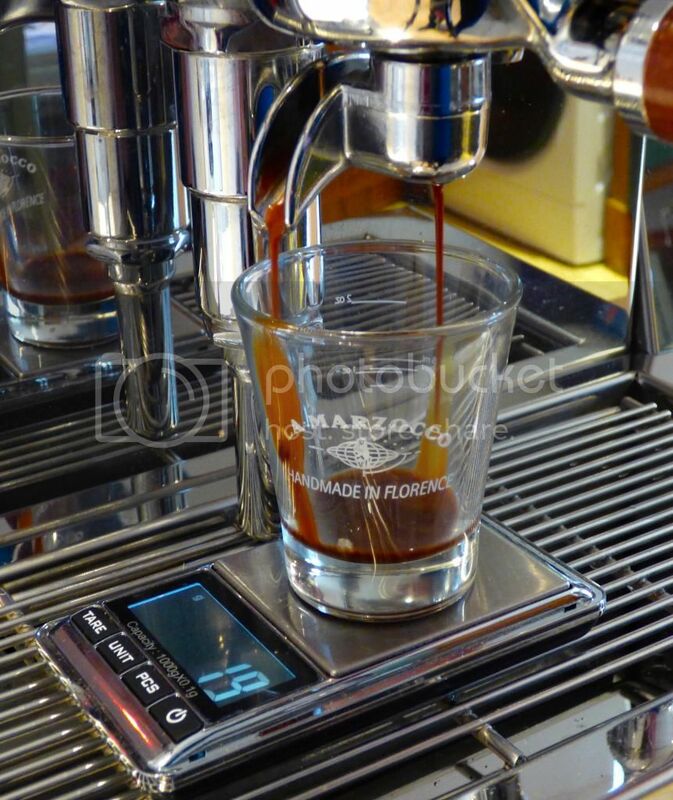 1ml of espresso doesn't equate to 1g of espresso though - weight is more accurate. Where do you measure your volume to, at the peak of the crema?, or when it subsidies? Also different coffees produce different amounts of crema. This isn't really giving you a common language or measurement to talk to other people about. Weighing then allows you to have accurate measurements of two of the variables in espresso making and therefore either keep them constant or be able to make accurate changes and see the effects of them. Weighing also allows you to talk in terms of a recipe or brew ratio, that you can use with other people. This along with a commentary on the taste (balanced, bitter, sweet, sour) allows other people to suggest how to improve the taste by changing some of the variables involved. The team at FunCaptcha has designed a Captcha for Coffee Forums UK which is now in operation. All new members will need to verify themselves as being human by performing 2 tasks whilst registering. Thank you for joining Coffee Forums UK. This guide should help you choose equipment in line with your budget that is suitable for producing an espresso based drink. Prices and suppliers will vary so any references are recommendations only. It is important that you set a realistic budget for your new hobby. You could consider a Gaggia Classic, Rancilio Silvia or even a second-hand Fracino machine such as a Heavenly or Cherub. Where is the best place to buy a cheap Gaggia Classic? Amazon Warehouse often has box-returns where the machine has been opened and may have been used (usually only once or twice) before being returned to Amazon where they are refurbed and/or repackaged and usually come with a limited warranty. What other items will I need? We wish you a safe and jolly festive season and a Happy New Year! A new, two-day national trade exhibition for the cafe industry is to be held in Harrogate in September 2015. Coffee House & Tea Room Expo is aimed squarely at the elite of cafe owners in search of the most elegant afternoon tea, most delicious lunch and snack menus and most sophisticated coffees, teas and other beverages. The Expo will open its doors on Tuesday 29 September 2015 at the Yorkshire Event Centre, Harrogate, and will attract managers and staff from coffee houses, tea rooms, cafes, garden centre coffee shops, restaurants and independent hotels throughout the country. The event will feature the latest products, ingredients, equipment and business advice for the catering industry and a range of interactive seminars on a range of relevant topics such as tea blends and brewing, and coffee roasting. There will also be hands-on training in latte art and the Expo will host the finals of the UK Chocista Awards, which will showcase the nation’s best offerings of hot chocolate drinks. Martin Colton, sales manager for Coffee House & Tea Room Expo said: “This debut show is an exciting opportunity for suppliers and visitors alike. With the launch of the Northern Futures Project earlier this year, and all of the talk in government of creating a vibrant northern hub, the Harrogate location was deliberately chosen as the ideal central point between this new northern powerhouse and the huge expanse of Yorkshire; the original home of the quintessential tea room. Admission is free by pre-registration. For more information on visiting or exhibiting, see www.coffeehouse-expo.co.uk. 10 roasters, 2 bars, 10 free masterclasses, 1 national competition, 1 film premiere, 26 exhibitors, art, music, food, barber, face painting, xmas gifts! Shaping up to be an amazing day and I'm super excited to be involved! We'd love to see as many home baristas there as possible so to encourage you even more (like you need the encouragement!) you can get 50% off your tickets by entering [email protected]. I'm running a latte art masterclass at the festival. All masterclasses are free so if you're interested in joining the latte art one then maybe start a list of names on this thread. Any other questions just give me a shout!